The University of East Anglia (UEA) is situated only 2 miles from the centre of Norwich, easily accessed by First Group bus No. 25. It runs between Norwich station and the UEA regularly and serves not only the university but also the world-renowned Sainsbury Centre for Visual Arts. The university is a hub of activity for non-students as well as students with its annual Literary Festivals (Spring and Autumn) attracting incredible literary names from around the world and a full programme of performance from the Drama Studio. Norwich is also home to NUA – Norwich University of the Arts – which is right in the heart of Norwich, much of it housed in beautiful heritage buildings. 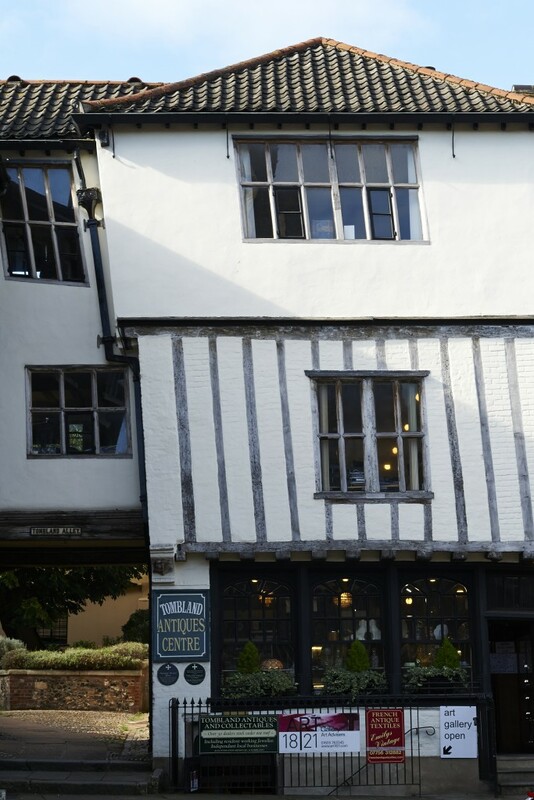 Norwich has plenty of great places to stay to suit all pockets. Great value B&Bs include Arrandale Lodge (from £55 a night) – 10 minutes’ walk from UEA. Beaufort Lodge (from £52 a night) – 10 minute drive UEA, Chestnut Grove (from £40 per night) – 5 minute drive UEA, Cringleford Guest House (from £60 a night) – walkable UEA. Hotels in the city centre include the 4* Maids Head, Holiday Inn Norwich City and the Best Western Annesley House. Luxury hotels with leisure facilities including great golf courses skirting Norwich include; Sprowston Manor, a Marriott Hotel & Country Club, Dunston Hall and Barnham Broom, Golf & Country Club. Norwich has an abundance of tasty places to eat and drink – no surprise when you consider it’s the capital of a county famed for its farming. Most independent eateries include menus brimming with seasonal local produce; many are also housed in some of the finest heritage buildings in the city. Try; The Library Restaurant Bar & Grill – recently refurbished and now including a very attractive bar, Le Bistro with its new Wine Loft – boasting great views of historic Norwich (The Castle, The Guildhall, City Hall, Norwich Market, St Peter Mancroft and The Forum), The Waffle House – a Norwich institution and The Last Wine Bar located in an old shoe factory, hence the name. 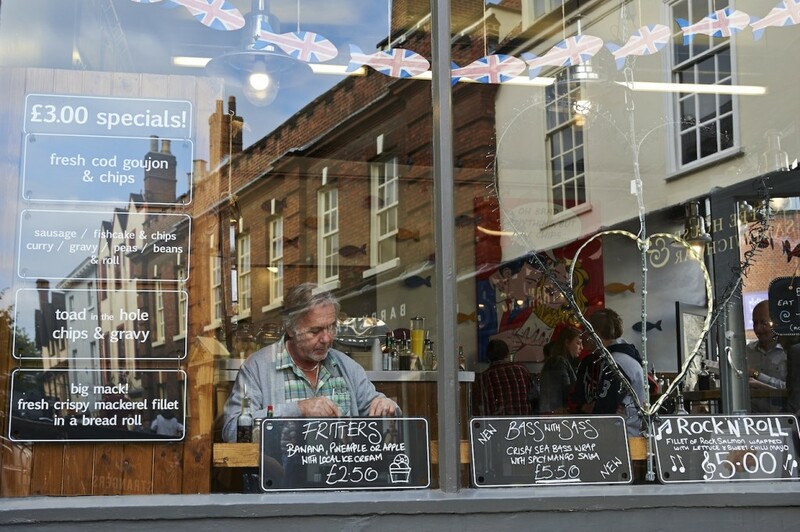 Norwich is also home to some wonderful unique cafes and food ‘on the go’ outlets to grab a delicious bite! Grosvenor Fish Bar is a hip place to enjoy delights such as ‘Bass with Sass’ and ‘Five Quid Squid’ – discover the amazing ‘Undercroft’, a cave like area to sit and eat. Hot Chip offers local potatoes cooked in rapeseed oil (half the calories of saturated fat) with amazing artisan toppings – they’ve got to be tasted! The Britons Arms coffee house is a 15th century merchant’s house with a delightful thatched roof (one of only 5 in Norwich). Imagine sloping ceilings, low beams, an open fire in winter and a courtyard garden in summer. The smell of freshly baked sausage rolls and steaming coffee hits you as you open the door. 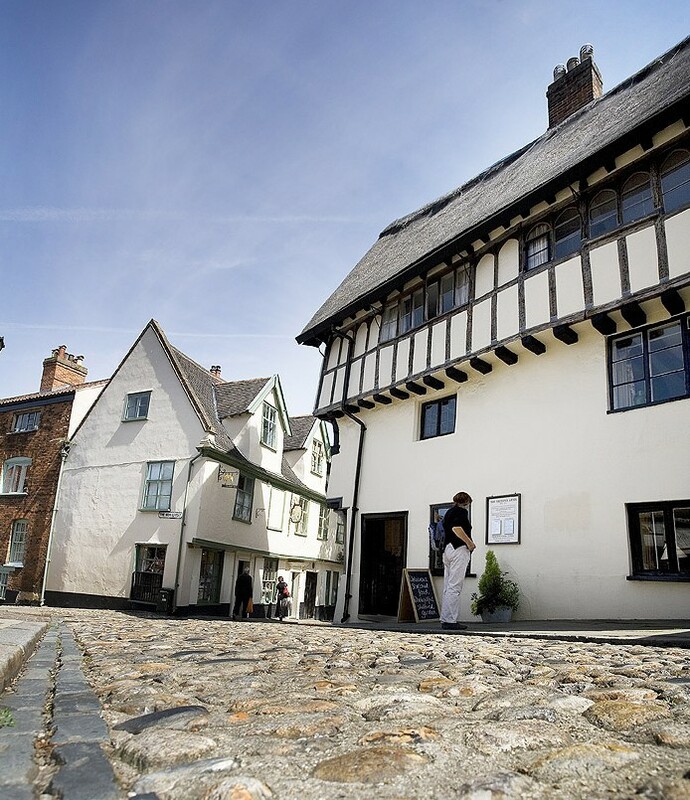 It’s a ‘not to be missed’ experience with the added star benefit of being situated in Elm Hill – Norwich’s most complete medieval street – which is picture postcard beautiful. 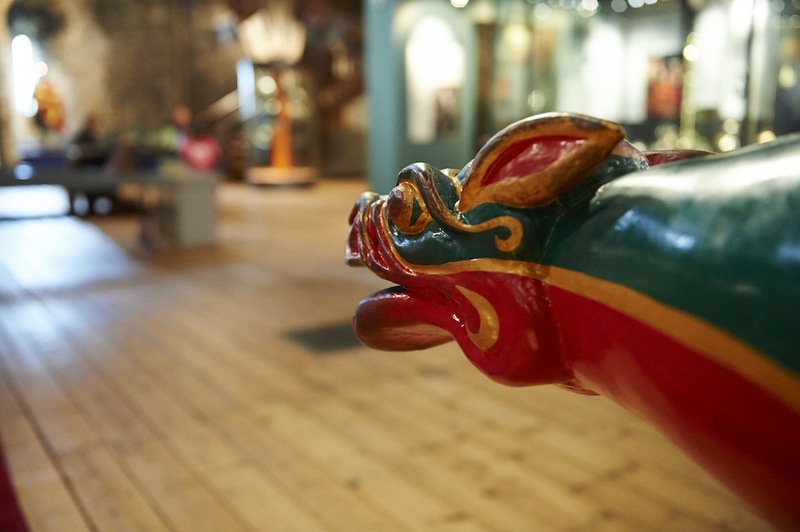 Norwich is blessed, being a medieval city, with over 1500 heritage buildings, two cathedrals, a Norman Castle and a pretty river offering great riverside walks. Visitors can explore easily as the city is extremely compact. One moment you can be taking in the Castle Keep, the next wandering Strangers’ Hall a stunning 12th century building, now a museum, featuring a series of inter-linked rooms with period settings (it’s absolutely delightful like walking through a giant dolls house!). And don’t miss the chance to stroll through the 44 acre site of Norwich Cathedral, You’ll see 1000 Romanesque roof bosses, the largest monastic cloisters in England and the Hostry, a tasteful addition to the cathedral where, cleverly, architects have combined the medieval footprint and remaining walls of the original monastic Refectory into the new build.